7 August 2011 – Allotment Plot 326 – Harvest: Tomato Gardener’s Delight = 3oz = 80g; Beetroot Bolivar = 1lb 4oz = 580g; Potato Madeleine 12lb 15oz = 5.9kg. 8 August 2011 – Allotment Plot 326 – Harvest: Runner Bean Enorma = 2oz = 60g; Potato Madeline 4lb = 1.82kg; Beetroot Bolivar = 1lb 8oz = 700g. 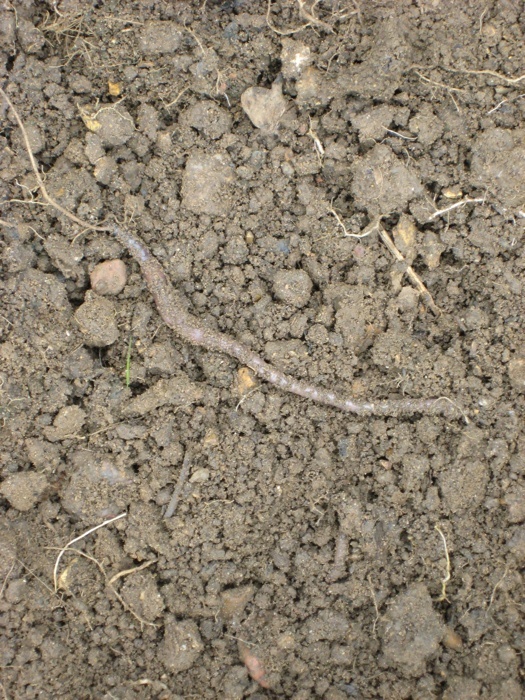 11 August 2011 – Allotment Plot at MERL – A fine mist of rain was falling across the garden. William Morris rolled out of his carpet from where he had been sleeping under the Mulberry Tree. His hands were covered in dark stains from the juice of Mulberry fruits. Ella Montt now understood why he liked the Mulberry Tree so much; the fruits are many and delicious! Mulberry Trees can live for a long time, and they will often look like they are falling down to one side, this is so they can re-root themselves in to the soil to insure their survival. Towards the base of the tree the Mulberry will grow long trailing branches that are also seeking to root themselves. Ella Montt cut the Nettles and Comfrey growing in the Brick Composter and scattered the leaves over the compost. 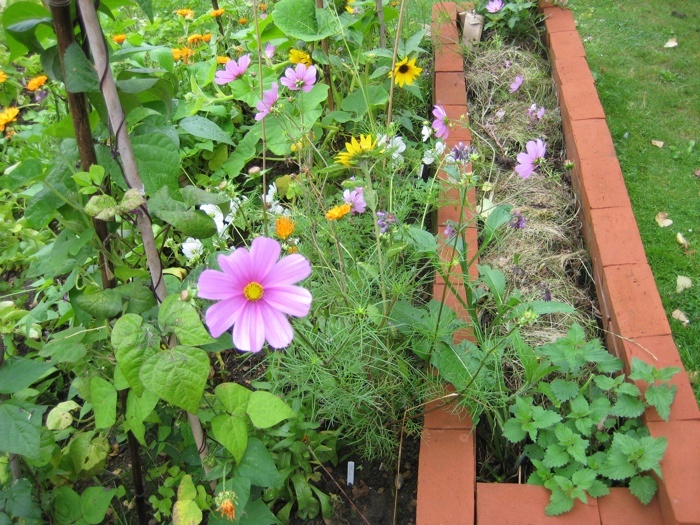 The Companion Planting’s wild beauty was tamed with a piece of string, because the Cosmos Cosmea was blocking vital sunlight access to the Squash plants. Some of the Pot Marigolds were removed for the same reason and their plant residue was added to the Composter. The Plot was saturated with the vivid colour; green was punctuated by orange, yellow, pink, white and scarlet (the latter from the runner bean plants). EB stepped out of the reading room window and walked across the garden with a fork. She dug up the first batch of potatoes. 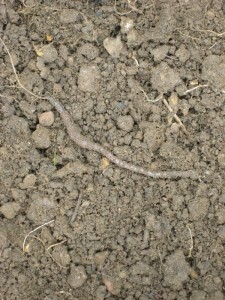 As the potatoes were removed from the soil, active earth worms were revealed. 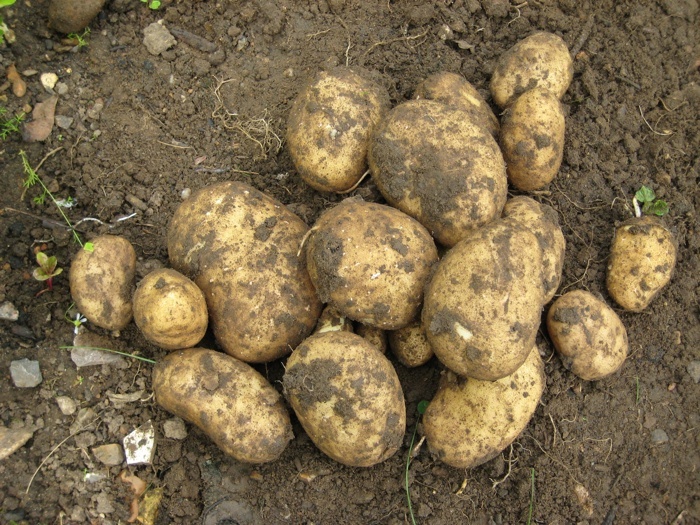 The condition of the soil had changed with the introduction and growth of the tubers. The change was a much desired improvement in vital soil fertility. It can take several years to improve soil for optimum growth and equally it can take just as long to deplete the soil of vitality depending on the growing methods employed. Harvest: Potato Lady Balfour = 5lb 3oz = 2.37kg; Herbs, Mint, Sage, Chives 2oz = 40g; Runner Bean Enorma = 14.5oz = 410g; Bean (French Climbing) Blauhide = 2.5oz = 70g, Blue Lake = 3oz = 80g, Neckarqueen = 1oz = 3og, Barlotta Di Fuoco = 2oz = 50g. 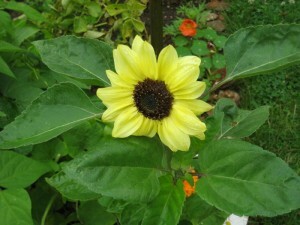 This entry was posted in Allotments, Compost, Harvest, Root and tagged Balfour Potatoes, Companion Planting, Harvest, Soil, Worms on August 17, 2011 by katecorder.